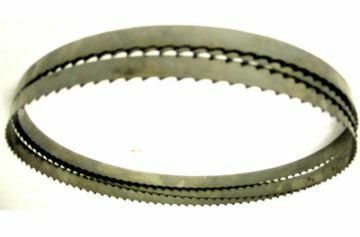 Meat cutting band saw blade measures 91 Inch x 5/8 x .022 x 4 Teeth per Inch. Accurate narrow blade made of super hard high carbon spring steel. Precision stamped, tempered tooth set. This butcher's band saw blade is suitable for cutting meat, bone, and frozen meat blocks. Fits Biro band saw model 22, Globe Stimson band saw model 111, and other butcher's band saws. Sold in bundles of 4 blades.